Start this dish 2 days before it is required. Scandinavians serve a rich pork liver pâté but it can be a little too heavy so we suggest a more French-inspired terrine such as this one. Make a couple up before Christmas then freeze one whole and the other already sliced so that you can defrost as much as you need. Coarsely chop the prunes and place in a bowl, pour the brandy and port over the top and leave to soak for 30 minutes. Rinse the livers and chop coarsely in a food processor with the pork and 175g of the bacon. Mix with the soaked prunes and their liquid, the onion, garlic, herbs, spices and seasoning. Cover and chill in the fridge overnight to allow the flavours to develop. Next day, line a 1.7 litre terrine or loaf tin with the remaining bacon rashers, leaving the ends hanging over the sides. Spoon the meat mixture into the terrine, press down firmly and fold in the ends of the bacon rashers. Cover the terrine with foil and stand in a roasting tin filled with cold water. Cook in a preheated oven at 180°C, gas mark 4 for 1 1/2 hours. Remove the terrine from the roasting tin. Cover a piece of cardboard the size of the top of the tin with foil and place it over the terrine. Weight the top with heavy cans or weights, allow the terrine to cool then chill, for at least 8 hours or overnight, before serving. 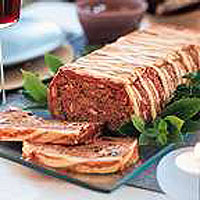 If freezing, re-cover and freeze the terrine once it is cold. To serve, loosen around the edges and turn onto a serving plate and garnish with fresh bay leaves. The pâté goes particularly well with a good fruity chutney such as Waitrose Apricot, Ginger and Garlic Chutney.